Removing internal walls to create space in the kitchen? Many of our customers think about enlarging their kitchen by means of taking out internal walls or carrying out some form of building works to create a new open space. Internal wall demolition is often referred to as a knock-through. This might involve anything from just cutting a new door opening, through to the complete removal of an entire wall. Load Bearing – Where the wall provides a separation between rooms and is also required to transfer loads from other parts of the structure such as the roof, floors and the impact it will have on foundations . Non-Load bearing – Is a wall that provides separation between rooms and are not required to transfer loads, often referred to as stud walls made from a wooden frame. Note: Care should be taken before removing any internal wall and should be done so by qualified trades people. Walls can have a number of functions that could affect the building and the safety of the occupants within the building, always consult a qualified trades person. Generally, you don’t need to apply for planning permission for internal alterations, including removing internal walls. However, if you live in a listed building, you will need ‘listed building consent’ for any significant works, internal or external. Plus, depending on whether your wall is load-bearing or not, you may need approval from your local council or Building Control. A structural engineer will need to specify an appropriate beam or lintel, and this should be done before getting quotes from builders so they know how much to charge along with knowing the materials required to do the job. Non-load-bearing walls – don’t support anything above them. They carry just their own weight, so they’re relatively easy to remove but its worth taking into considerations such as insulation or electrical cables, water and gas that may run through the wall. There are some simple checks you can make to work out if a wall is load-bearing or not. Tap on a few places on the wall and listen out for a hollow sound, with no hollow sound you’ve probably discovered a block wall that could either be supporting the ceiling or it could be a load-bearing wall, all external walls are load bearing. Take a look upstairs to see if there’s a solid wall directly above. This can indicate that the wall you want to remove is potentially load bearing, so you’ll need professional help. Not sure? always get a second opinion from a builder to come and inspect the wall for you. He’ll quickly spot if it’s load-bearing. Load Bearing – If the wall you want to remove is load-bearing, you’ll need a reinforced steel joist (RSJ) to support the upper floor when the wall’s removed. A structural engineer is required to calculate the correct load needed and will create drawings. 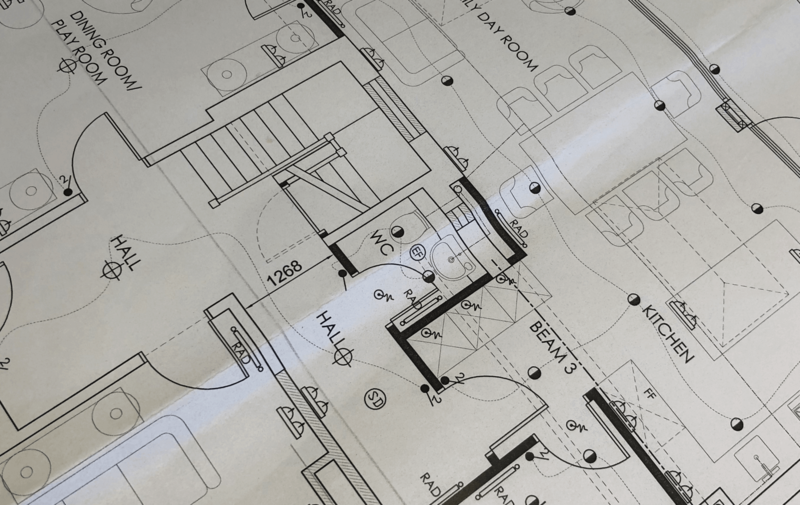 These calculations and drawings are then given to a builder who will liaise with a steel fabricator to manufacture the steel joist and deliver it to site, it also allows the builder to know how much to charge you from the start of the job. Once the steel is fitted, a building inspector is invited to inspect it and make sure it complies with the drawings and calculations. The steel is then boarded, plastered and painted. When the work is complete, the building inspector will sign off the project and issue a building approval certificate. You need to keep hold of all the paperwork in case you want to sell your home. Regulations have changed, so now, if you were to sell a property, you have to have all your completed paperwork stating the works have been completed correctly. If you don’t have the necessary paperwork, you will be required to commission an engineer to check what the builder has installed and produce calculations. This will be at your expense! Nixons Kitchens offer a turn key service and can offer service such as removal of internal walls, including those which require RSJ’s however you will have to contact your local authority to gain calculations from building control. Nixons can advise you on contact details and look at your project to advise on next steps if required.